The competition for heating and cooling repairs is fierce! We hear this constantly but know that we can’t advise our clients on a single silver bullet to make them come out on top. (In fact, no one can, so run far from anyone who assures you otherwise.) However, after decades of experience as HVAC SEO specialists, we know that it takes many little things, done really, really well to help improve Google rankings and get your phone ringing daily. One of those “little things”: online review sites, which often considered citations. We’ll talk about the reviews themselves another time, but for today, let’s focus on which sites are going to drive leads to your company, and how you should manage the content on those listings to stand out from the crowd. One of the really nice aspects of Google My Business is that you can manage your company listing from a user-friendly dashboard, and the information you enter instantly updates across Search and Google Maps. Because local searches for heating and cooling repairs is vital when service areas are fixed, this is the absolute best way to keep your NAP accurate in the most visible listing you’ll have. But here’s the thing, even if you’re optimizing well, if you haven’t claimed and updated your GMB listing, you may never get that call due to incorrect information. A simple typo could cost you tons of calls, and a poor user experience could result in your business tanking in the rankings. However, with a strong listing that incorporates HVAC keywords throughout the quality content, and a linked listing that connects viewers to your website for more info (like service pages with great on-page SEO), you’re far more likely to earn their business. A new Google Ad feature worth mentioning here is the Google Guarantee badge. These are paid listings (versus organic results, which are still typically seen as most valuable) but they add an extra layer of comfort for customers who want the backing of a third-party. This feature ties to your GMB account and lets you manage communication via Local Services booking. Because Google is recognized as an authority and trusted by billions of users, this paid listing could really help a newly launched domain see some action before it has put in the years to rank organically. 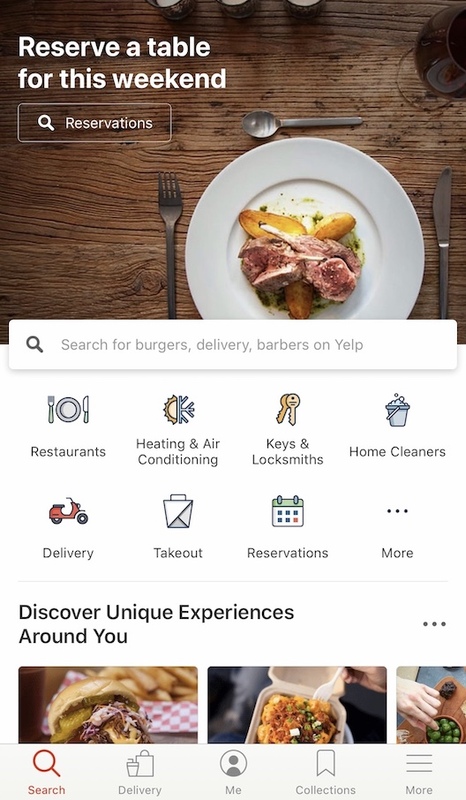 Millions of users continue to favor the Yelp app and website for finding everything from restaurants to air conditioning specialists in their area. (In fact, there is even a quick select icon for Heating & Air Conditioning on the landing page of the app!) Because the app is closely tied to mobile use, the local search aspect is clutch and tends to provide a favorable user experience. The other benefit to users is review-rich pages that are tied to an identified reviewer (versus anonymous posts). Sure, you’ll still some unreasonable nonsense, but it’s not nearly as rampant as sites that allow unidentified reviews. It is also my experience that the reviews on Yelp tend to be more detailed than some other online review sources, so having a great listing for your HVAC business on Yelp is a fantastic offering for potential customers to find you…and to be impressed. While this might not seem like the SEO tips you’d expect from us, it’s important to realize that engaging with customers is vital for the life of your company. This is true of almost any industry, but because you have a tremendous opportunity to earn business from personal referrals, thinking about how you engage with the customer is a great investment of time and energy. Social media marketing, for example, hinges on good engagement to get your posts seen and allow your business to thrive online. Replying to reviews on sites such as Google and Yelp is a great way to show that you’re appreciative of your customers and tuned-in to what they need. Even if a review was mediocre, when a business owner responds in a respectful and professional way, that still leaves me with a positive impression of the company. In fact, the response can be more valuable than the review or star-rating itself! You may not think of this as a review site, but it’s not uncommon for Facebook reviews to show up on a Google homepage for a company listing. As we covered earlier when discussing the power of Google rankings, a potential customer may not even make it to your website, but they will likely check out a few ratings before clicking the phone number from the SERP. While a user would have to be logged in to leave a comment or dive deep into Facebook content, reviews are visible to everyone (with or without an account), and should be considered as important for your online reputation as any other. In fact, when potential customers are vetting your company for their HVAC repair business, they may start with a Google search of your company name, and then check out serval online review sites to get a sense of the service you offer. Because of the incredible traffic that Facebook gets, this listing usually shows up fairly high in the rankings, and should therefore be given plenty of love. But if you’re all reviews and no content, the viewer may be less inclined to pull the trigger. Don’t forsake developing a great secondary website with your social media business pages, starting with Facebook for Business. While we’ve spent the majority of this article talking about how to best claim and manage these various online review sites for your HVAC company, they won’t do you (or your customers) much good if there are no reviews to view. While there are some tools for making review requests more streamlined, the fact remains that you simply have to ask for them. It’s assumed that only a small percentage of customers are likely follow through to leave a review — good or bad — after their heating and cooling repairs, so you’ve got to be diligent about asking everyone to improve the odds of getting a decent turn-out. We know that consumer behavior shows that folks are more likely to call a service provider with lots of reviews, but a mid-to-high star rating, versus a company who has just a handful of reviews, even if they’re all five stars. The quantity has weight for Google rankings, too, whether the reviews are made on your GMB page or elsewhere. For Facebook specifically, you have the benefit of a more engaged user than you’d find on Google, for example. The billions of Facebook users spend a lot of time on the social network every day, so don’t hesitate to post every so often a request for existing customers to post a review. And if you’re trying to build up reviews on Yelp versus Facebook, tell them! It’s perfectly acceptable to make it known that you’re trying to bolster your brand reputation on a given site, but the key is to provide a link to make it as easy as possible for an existing customer to help you out. Don’t make them search or you’ll likely lose that willing participant. While quantity is important to help search engines recognize your business as reputable and legit, it’s also worthwhile to invest some time into each listing to ensure it’s a strong entry point for new HVAC customers to find your business, and to get those online review sites working for you!